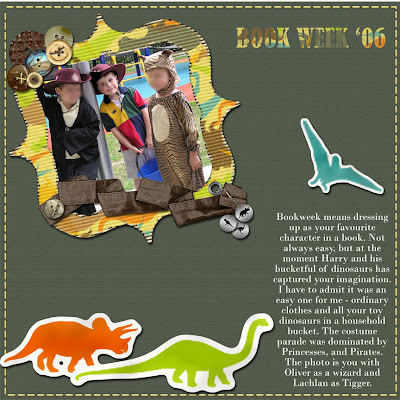 The Curly Wirly Twirly Girlies: RUN -ning with the Dinosaurs ! RUN -ning with the Dinosaurs ! Happy Mother’s Day to any Mum’s . I am having a very quiet one, hubby is off interstate visiting with his Mum and as my sister in law has realised the benefit of sending them home to Mum is uninterrupted scrap time ! I had a lovely brunch with the kids, a girlfriend and her daughter, and my two have been told they must have some rest time if they want to watch Gladiators tonight. Last night I got some scrapping done and did a page for a piccie of the noisy woisy boy-zy from Book Week a couple of years ago. Thankfully his favourite books at the time were Harry and his bucket full of dinosaurs and that was a relief to this Mum. I got off easy, ordinary clothes, and a plastic bucket with his favourite dinosaur figurines in it. This is the layout I did for it. I have used Pam’s gorgeous folded ribbon , buttons from my button tin freebies, the chain is from the boot camp alpha I did, and some other pieces I made for this layout. The noisy woisy boy-zy has been distracted in helping with this so only provided “supervision and approval” of the dinosaurs I made for him. But any of the things I made are included in this download. Hope you have a great weekend. omg! i love all of it! 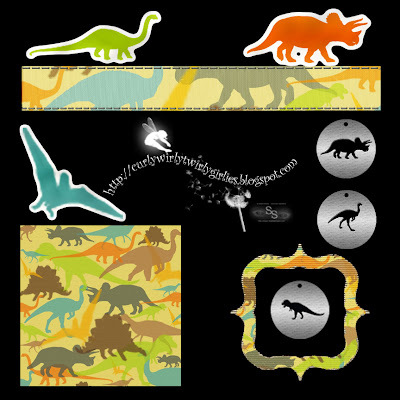 the gorgeous paper, the bright dinos, the little round tags with dinos punched out ... i'm just grinning ear to ear! ty ty ty! It's strange that your mother's day follows the US date. I guess we are the only ones to celebrate it in March!! Oh well, happy mothers day Erika - hope you get spoiled by your little ones ;o) Hugs from England. These dinos are so cute. Thanks so much. Thanks a bunch! One of my grandsons was crazy about dinosaurs, so this will be great for some of his younger years pix!